This past Saturday morning, we were exploring the Royal Palace and the infamous Temple of the Emerald Buddha in Bangkok, Thailand. The sweat was pouring down our backs and literally dripping off our faces, even when we were just sitting in the shade. We were constantly scratching, our whole bodies covered in mosquito bites. And we were very tired. 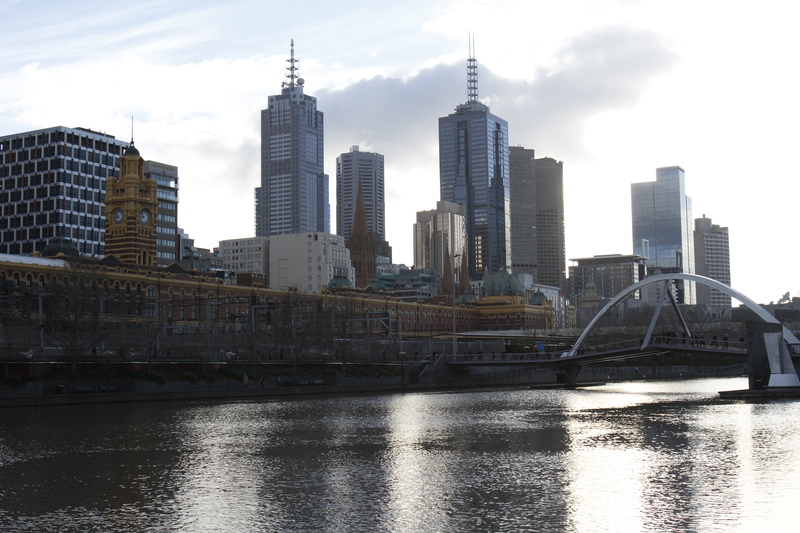 By Sunday morning, we found ourselves strolling through the breezy city of Melbourne, Australia. The air was cold and crisp, the wind blowing in our faces felt glorious, we actually wanted to be in the sun, and we felt completely refreshed. We were re-energized, and we’ve been walking all over the city ever since. It is the height of winter here, but to me, it feels like a beautiful fall day in Chicago – perhaps mid to late October. The city itself reminds me of Chicago, as well. It’s on a big body of water and it has a river running through it. The air is crisp and the wind is always blowing. There are lots of public transportation options. There’s an observation deck in the highest building, like the Sears Tower (although the Eureka Skydeck here is actually the highest viewing deck in the Southern Hemisphere!). And that’s probably where the similarities stop – I know I’m exaggerating the comparison, but I guess that happens when you’re homesick. Oh, if only Chicago winters could be like this! 1. Trams: Melbourne has an extensive city tram network. I know that many U.S. cities used to have trams, but took them down in 50’s and 60’s – something about the wires looking ugly. Listen – trams are cleaner, more environmentally friendly than buses, and they’re fun to hop on and off. Let’s bring back the trams, people! 2. Bike share: Melbourne has a great bike share system and it’s all electronic. There are stations all over the city, and after becoming a member online, you can walk up to any bike and borrow it. The first 30 minutes are free, and if you’re done and you get to a station that’s already full, just press a button on the bike and you get fifteen extra minutes to ride to the nearest station for free. Plus, they’re pretty cool bikes. 3. 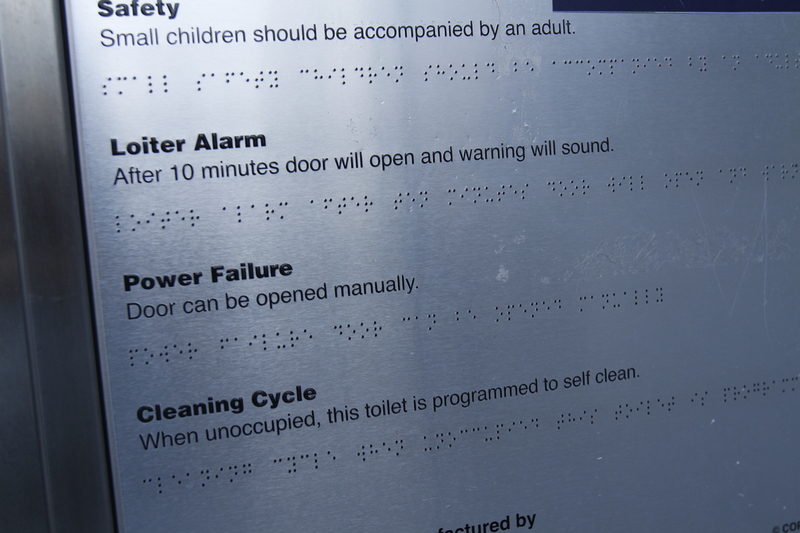 Self-cleaning public toilets: We came across an interesting site by the river. There was a little building that housed a free public toilet. It cleans itself when it’s not occupied, and it even has a “no loitering” policy to keep the sketchy people out – the door will open and an alarm will sound after 10 minutes of someone going inside. I’m not sure about the 10 minutes rule, but I think the self-cleaning thing is pretty neat. 4. Free public transportation options: Melbourne is extremely visitor friendly. In addition to having a fantastic visitor center, there is a free tourist shuttle that runs all around the city everyday. There’s also a free city circle tram that runs around the city center, stopping at all major destinations. It was certainly a drastic change going from such temperature and cultural extremes, but it was a needed change. Not that Thailand was that bad – I really loved Thailand and I wished we had spent more time there – I will definitely be returning one day. But now I can understand the language (and listen to the best accent ever), I’m eating hamburgers and drinking wine and actual coffee, walking down the street isn’t a chore, and cold weather never felt so good. We move on to Sydney now, but I certainly won’t forget the wonderful rejuvenation and Chicago flair that I experienced in Melbourne. This entry was posted in Uncategorized and tagged Australia, journey, Melbourne, round the world trip, Travel. Bookmark the permalink. Erin – great post, loved your comparison experiences of Thailand to Australia, Mebourne to Chicago as well as your reporting on the city. Looking forward to hearing from you about Sydney. Erin:; This is excellent reporting. It really makes us feel like “you are there” in Thailand(sounds like it was very hot; sorry to hear it(!) and more at home with Australia. Glad you got a bit of a break from the arduous side of travel or as some say, travail:) And thanks to Gail for her excellent meditation on “the Now”. In fact the contrast, between what mother and daughter have to say, is fascinating!